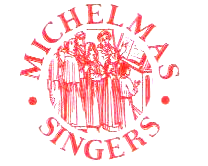 The Michelmas Singers is a renowned mixed chorus of 25-30 voices based on Teesside. Developing three to four concert programmes each year – March/April, June/July, October/November – we perform a wide range of music, unaccompanied or with keyboard or chamber orchestra. We favour music of the 16th and 17th centuries and the past hundred years. Rehearsals are held on Friday evenings in Teesside and the five that precede a performance are led by our resident conductor Sam Gardner. For more about rehearsals, click Join us (below the header or in the right-hand column). The music we prepare is performed in a variety of venues, mainly on Teesside. Enduring favourites among composers from our repertoire include Byrd, Monteverdi, Poulenc, Purcell, Tallis, Vaughan-Williams, Victoria and Whitacre. For music under current rehearsal click Concert programme; earlier events are at Concerts past and the previous year’s composers are listed at About us. Concerts range from intimate unaccompanied performances of madrigals and part songs – some with interludes from readers or instrumentalists – to major and challenging works of the choral repertoire with orchestral accompaniment. Though many events are self-promoted, we are happy to perform in concerts promoted by organisations such as music societies and other charities.